Neive has been inhabited since the Neolithic, about 5,000 years ago. Its territory, which is occupied by thick woods and is rich of water, was invaded by the Ligurians who installed there, standing their ground against Gallic people, until Romans’ arrival, around II century B.C. Neive was crossed by Via Aemilia, which was built in 109 B.C. for the consul Scauro’s will to link Acqui to Alba. 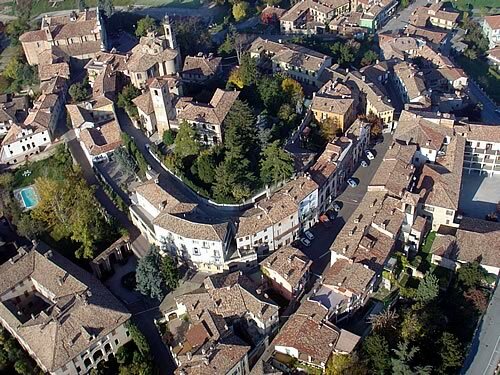 The village owes its name exactly to a noble Roman family, the “"gens Naevia" or "Naevii", who possesses it. The historical events of Ancient Rome did not find here a large impact, being this a border land. However, in the first centuries after Christ barbarian raids were not rare. After the fall of the Western Roman Empire, in V century, the territory was invaded by Sarmatians, who remained there until Longobards’ arrival in VI century. Under Charlemagne Empire, the village was ceded as a feud. Upon the fall of the Holy Roman Empire, Hungarians and then Saracens arrived. The construction of the first fortified castle, today disappeared, dates back to this age. Neive and Alba territory were set free by Ottone I of Saxony around the end of X century. The institution of the “cella Nevigiensis” dates back to this period, a Benedictine Monastery that depended on the Holy Cross Abbey in Mortara (AL), of which today only the Romanic Bell-Tower remains. We know that, between XI and XIII centuries, the Neivese feud was divided among some local Lords, in particular the De Revello; it gave itself status of Municipality around the year 1190 and followed in their events once the Municipality of Alba once the one of Asti among which it was divided, as well as the continuous fights between the two eternal rival cities. In 1274, because of a dispute between Asti and Alba, the Neive castle was assaulted and destroyed out of spite. In XIV century Alba and Asti were torn by the fights between Guelphs and Ghibellines. In 1387 Neive followed Asti under the Lordship of Giangaleazzo Visconti, becoming dowry of his daughter Valentina, who married the Duke of Orléans. It remained under this Lordship until 1512. Afterwards it was dominion of Francis I, of Charles V from Spain and, in 1530, it passed to Charles III of Savoy. From 1560, after about 17 years of French usurpation, it came back in the hands of the Savoy, with Emmanuel Philibert and his son Charles Emmanuel I. In 1618, under his reign, Neive became feud assigned to the Earl Vittorio Amedeo Dal Pozzo, already Marquis of Voghera, who took on the title of first Earl of Neive. The last countess of Neive, Maria Vittoria, married the second-born son of the first King of Italy Victor Emmanuel II, becoming for a short period Queen of Spain as well. With Savoy Family, Neive followed the lots of the kingdom until the constitution of the Italian Republic.